WOMAN’S CLUB CALENDAR 2016 HITS CEDAR KEY – Get Yours While They Last! The Cedar Key Calendar, which has become a tradition in three years, will arrive in Cedar Key this Festival Weekend. “This year we have been offered pictures from over 25 photographers, and the results are better than ever!” says Calendar Coordinator Vicki Crumpley, of the Cedar Key Woman’s Club. Visitors love the calendar, but it is Cedar Key residents who send the calendars away as gifts that have become an important part of the calendar’s success. Pictures from Cedar Key now hang in homes in almost every State – and in Canada, England, and Germany! Where else could you find such a beautiful memento for just $10? Last year more than 800 calendars were sold, and proceeds from the project were used to fund many Cedar Key causes supported by the Woman’s Club, such as the Cedar Key School, the Food Pantry, the Woman’s Shelter, the Seniors’ Lunch program, Arts Center programs for children, the Library, and Fisher House in Gainesville. Work on the calendar continues all year – we already have two submissions for next year’s calendar! The support from businesses who carry the calendar is an important partnership for the Woman’s Club and very appreciated. On Festival weekend you can buy your calendars at the CKWC booth in the Park, or from the Cedar Key Market, Dilly Dally Galley, the Chamber Welcome Center, or from the Historical Museum. 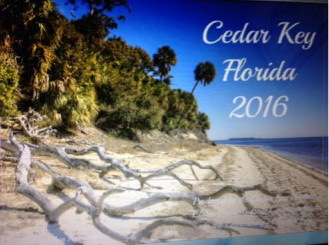 Thank you for your continued support for this beautiful Cedar Key calendar!